I rationalize my obsession because washi tape is so functional and versatile. 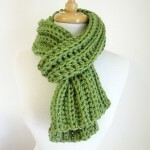 I frequently use it to wrap gifts, embellish gift bags, make cards, and decorate candles. One really fun thing I made recently was some washi tape twist ties; they’re perfect for tying off little treat bags! 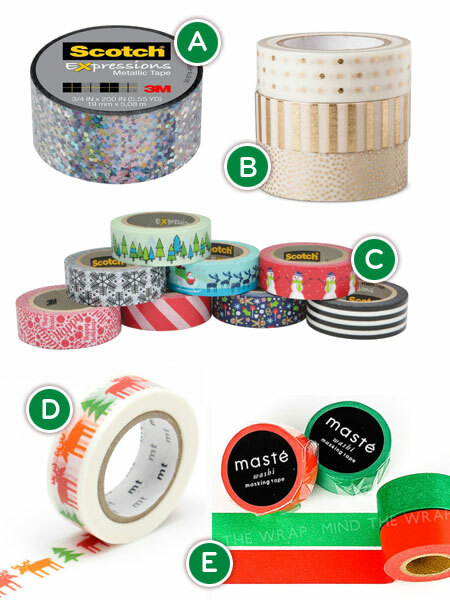 Since I can’t get enough decorative tape in my life, I thought it would be fun to share some of my current festive favorites with you. Oh my goodness, the sparkles! This metallic tape technically isn’t washi tape, but it’s so pretty that I had to include it. I have a several rolls of this metallic tape in my stash. Not only is it perfect for the holidays, but it’s one that I use all year for various occasions. This trio of tape is so dainty and shimmery—I love it! 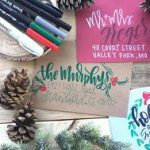 You can use it to embellish gift boxes, bags, or even on the envelopes of your holiday cards. I’m in love with this Scandinavian moose tape! This design is discontinued by MT, so the best way to get it is on Etsy. Depending where you live, you may prefer to buy it from this shop (UK) or this shop (US). You can’t go wrong with classic red and green tape in your collection. Solid colors always pair well with most wrapping papers and other patterned tapes like the moose tape above.